A review of Blair G. Van Dyke & Loyd Isao Ericson, eds., Perspectives on Mormon Theology: Apologetics. Greg Kofford Books, 2017, 279 pages with endnotes and index. Abstract: An analysis of the history, scope, and effectiveness of Mormon apologetics is long overdue. 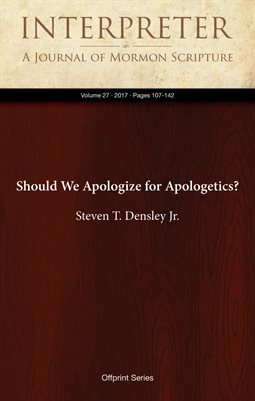 Unfortunately, Perspectives on Mormon Theology: Apologetics falls short of providing an in-depth analysis of the field and instead provides a very limited history, very little discussion of the scope of Mormon apologetics, and little discussion of the impact of Mormon apologists on Mormon thought. Furthermore, no attempt is made to discuss how apologetics has affected the arguments of critics of Mormonism. While a few articles do approach apologetics in a positive way, the work is largely critical of the activity of defending the Church with scholarship or of providing academic research to help support the testimony of members of the Church.